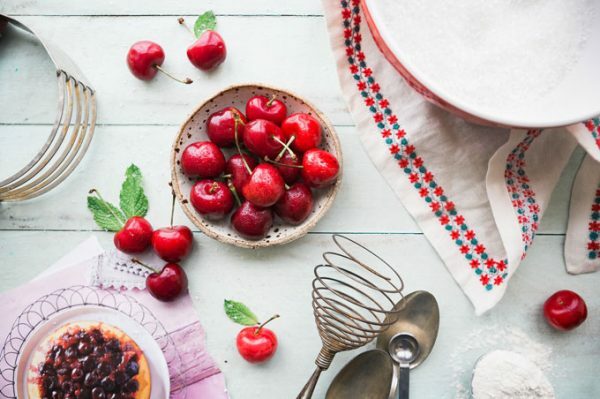 A round up of cherry recipes for you. Buzzed cherries, apparently that’s what y’all are searching for in July my fellow Americans. So, I thought I would focus my weekly recipe link round up on cherry recipes of all kinds, especially because I’m still seeing cherries all over the produce aisles and they look pretty sweet. Buzzed Cherry Bombs are like getting two recipes in one because you’ll have vodka infused cherry juice as a leftover once the cherries have fully infused! I wouldn’t mind if a jar of cherry compote was left on my porch. Red, white and blue balsamic cherry pops are what I need in my freezer this week. We are having a heat wave in Maine of all places. Cherry Berry No Bake Cheesecake should earn a spot at your next picnic. Black Forest Cake is another excellent use of those pounds of cherries sitting on your counter. I want to shove these cherry pie bites in my mouth two at a time. Your turn: What’s your favorite recipe using cherries?